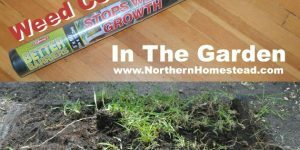 Freezing temperature is something we constantly deal with in a northern garden. 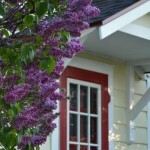 Plant protection from frost is much easier in spring when plants are small, which is one of the reasons I like to start things early and extend the growing season as much as I can up front. Young plants are also more frost tolerant than mature ones. In our area there can always be another frost after the ‘last day of frost’. Many plants are frost tolerant and do not need frost protection till about -2 °C = 28 °F. Some can stand even more. 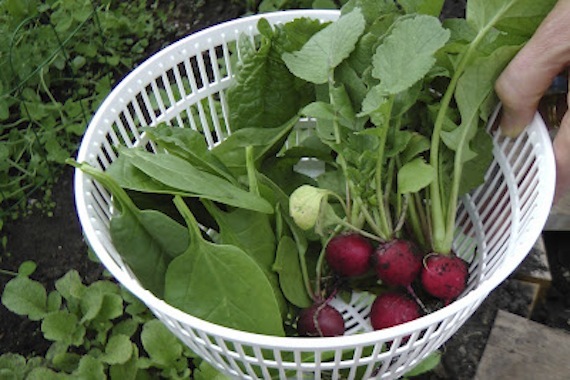 Crops like peas, the whole cabbage family, salad greens, radish, carrots, and beets do not mind a bit of frost. Read more here: how different plants react to frost. With that knowledge you can plant frost resistant plants in times when there is danger of frost and keep plant protection work to a minimum. 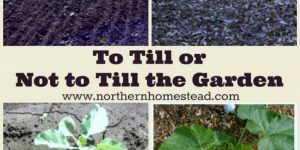 See when to plant what to avoid losing tender plants, but still get an early harvest from plants that don’t need as much protection. 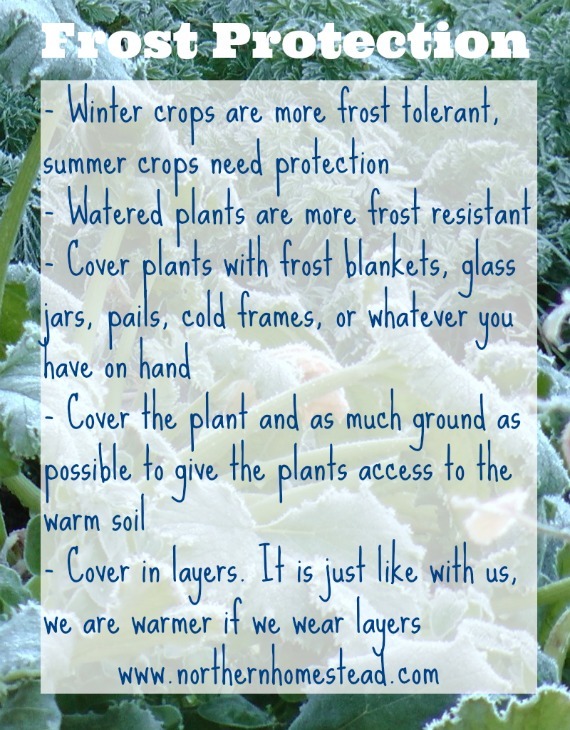 Winter crops are more frost tolerant, summer crops need protection. Watered plants are more frost resistant. Water the plants before the frost or in the morning after, before the sun comes out. Cover plants before the frost with whatever you have on hand, so the frost can not drop on them. Cover the plant AND as much ground as possible to give the plant access to the warm soil. Cover in layers. 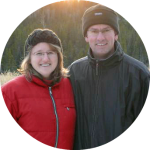 It is just like with us, we are warmer if we wear layers. 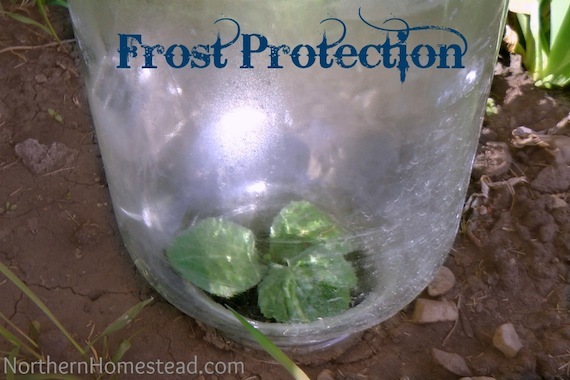 Common plant protection from frost (other than a greenhouse) are plastic tunnels, straw, cold frame, glass jars, milk jars, “Hot caps”, frost blanket, bed sheets, … the list goes on. It does not matter so much what you cover the plant with, just do not let the frost touch the plants. 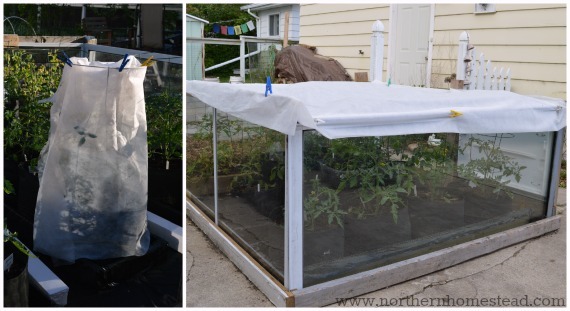 However, if frost protection needs to be done for a longer period, a few days, weeks or sometimes months, frost blankets and glass jars are are my favorite. Let us take a closer look at them. A Plant Protection Blanket or also called Floating Row Cover is a non-woven garden fabric cover, ultra-light and resistant to exposure to the environment; it allows light, water, and air to pass through and is reusable. 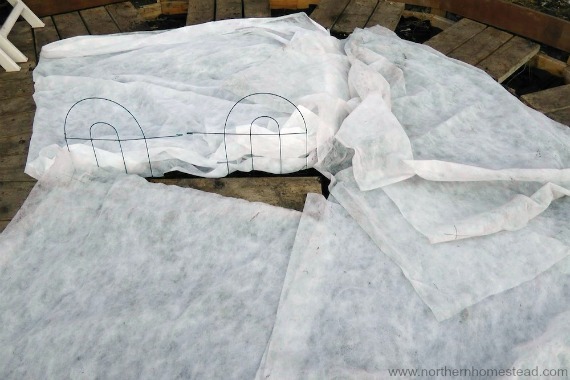 A Floating Row Cover comes in different thickness and acts as frost blanket and some wind protection. It also can provide organic insect control, traps heat and moisture to produce bigger, better, and earlier crop yields. It is hands down one of my favourite products in a cold climate garden. We are big fans of greenhouses. 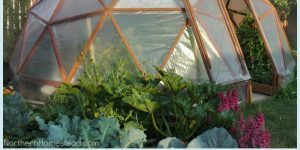 When it comes to frost protection, a simple greenhouse covered with plastic gives you about an extra 4 degrees more or less, depending on the thickness of the plastic. A Plant Protection Blanket used in a greenhouse would double the protection. Since there is no wind in a greenhouse it makes for a perfect way to grow plants early, or in milder climates all winter long. Frost blankets are very light weight and can just be put over the plants with or without any wiring for support. You will have to weigh them down so the wind does not blow them away. The Floating Row Cover can be left on all day since it allows air circulation and light – plants will not cook under them. It makes for way less work than plastic protection would be and I am always for simple. 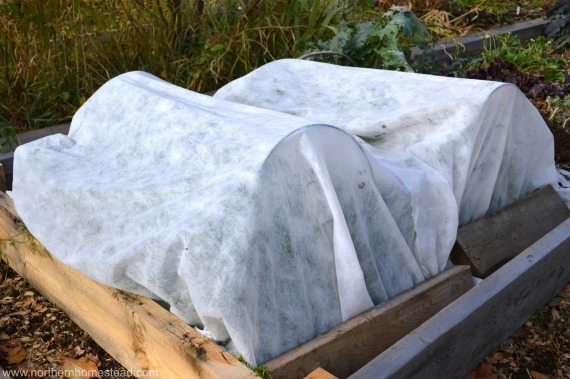 Frost blankets are a simple way to protect whole rows or grow beds. Tomato plants can be easily wrapped in a frost blanket using a tomato cage and some clothespins. 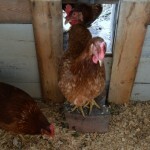 It also makes a great ‘roof’ for a cold frame. It is just like with us, we are warmer if we wear layers, so cover plants in layers, too. A Floating Row Cover is so light weighted that two to three layers will still have less weight then a bed sheet. However, whatever cover is used, the cover does not have any heat in itself. The heat comes from the ground that is still warm from daytime. So cover as much ground as possible to give the plants access to the warm ground. If the temperature drops really badly, string lights can be used under the blanket to give some heat. 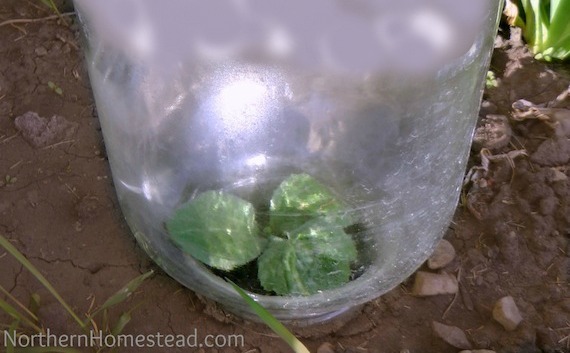 To protect plants with jars or glass cloches is very old-fashioned. It is not very practical for commercial growth, and that might be the reason why it is not very well known anymore. But for a home garden it is great. 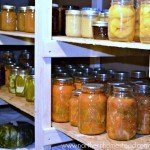 Glass jars are thicker than plastic or frost blankets and give more protection. Also glass jars are not so sensitive to wind, another advantage to milk jars. Under the glass jar a micro climate is created, and if the weather gets warmer than expected it starts to build up condensation and rains in there – a fun thing to watch. However, if the weather gets really hot, the jar needs to be removed, otherwise you might cook the plant. 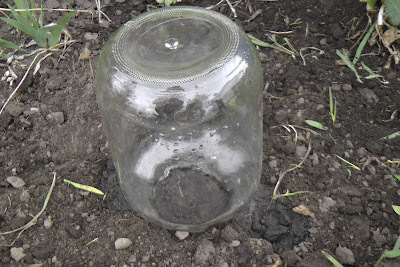 Our last frost day is end of May, on May 9th I planted a zucchini seed under a jar. May 28th the zucchini plant is growing nicely. This works very well! Choose a jar big enough for the plant to grow in. Leave the jar on all day, except for really hot days. If you remove the jar during the day, make sure to put it back on the plant before it is getting cold at night so warm air is trapped in the jar. On very cold nights it is easy to give the jars a second layer of frost protection with a blanket or even a bucket on top of the jar. Jars are my favourite way to protect single plants, like an early zucchini plant or a cucumber. 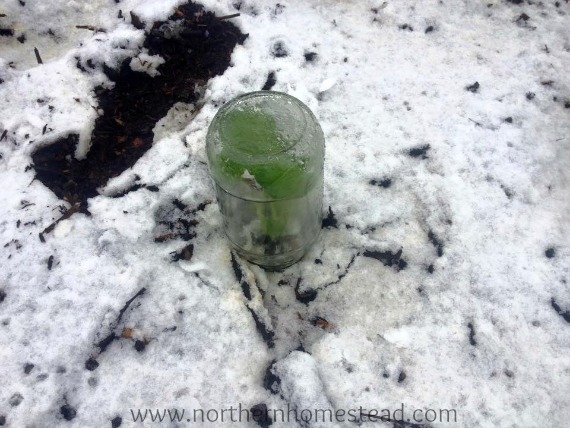 Glass jars are also great for protecting seedlings in sudden, wet, spring snow. Spring snow is not unusual in Alberta. Seedlings that can break from the weight of the snow, like my Brussels sprouts, can be easily protected with a glass jar over them. Here in the deep South, our winter’s are more mild but plant protection is still necessary. I love greenhouses too! All good things. I’ve never heard of frost blankets. I’m going to have to look for some. I usually just grab whatever extra blankets we have to use the few times it frosts here. Last year I tried some ag bags and tarp – bad idea. I use whatever blankets in the fall sometimes too, but frost blankets are better if you have to leave them on for longer. Yes, growing in Alberta is not an easy task, but worth it. That’s quite the process! WOW! I’m not sure I could do all that! 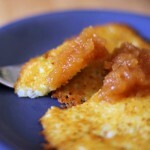 I always learn so much when I read your blog posts! I never thought about using jars to protect plants. Great ideas! Aww, thank you Alli. I enjoy reading your blog too. I LOVE your greenhouse! Very cool (no pun intended). I’ve seen people use plastic jugs for cover, but never thought about glass jars. Kudos! Glass works better because it isolates better. 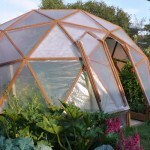 And thank you, A geodome greenhouse is great! Growing in the cold is challenging. 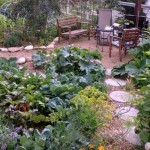 It often takes up to 3 years to get a garden going and build up a good soil, so do not gave up to soon.